A diver dressed as Santa Claus swims inside a fish tank at the Tropicarium aquarium in Budapest, Hungary, December 6, 2018. Image used for illustrative purpose. Muscat - One of the most anticipated projects in the country, Mall of Muscat, is set to open its doors to the public on April 15. 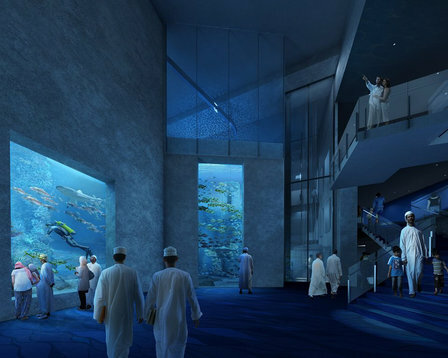 The key highlight of the ambitious project is the Oman Aquarium, which spread over 8,000sq m is the largest such facility in the Middle East. It will have over 30,000 animals and many exhibits including a walk-through tunnel. He added that Oman Aquarium will be opened the same day while other attractions like Snow Village and Go-karting tracks will open at a later date. About the material used in the aquarium, the company said that ‘in total we have installed 92 acrylic panels which amount to a total weight of 81 tonnes of acrylic’. The aquarium is also collaborating with educational institutions and will study coral relocation and growth rates of a number of Omani coral species. It is also looking at fecundity and breeding behaviours of Amphiprion omanensis, which is a clown fish species. It is specific to Oman and only found in a few areas of Dhofar and Masirah Island. Central to the aquarium experience will be a ‘Voyage of Discovery’ with the illustrious Omani seafarer Ahmad Ibn Majid, who sailed the Arabian Sea and world oceans during the mid-1,400s.